Police are investigating the theft of a bronze memorial plaque listing the names of the those who died in war. The plaque is thought to have been stolen overnight between Monday and Tuesday from the memorial on Park Road in Crumlin, Caerphilly, known locally as Mining School Hill. Local councillor Vera Jenkins says the theft has caused upset in the village. 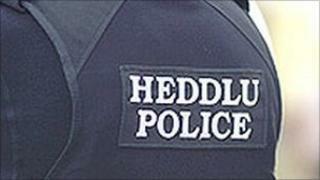 Gwent Police has issued an appeal for information. Ms Jenkins, who represents Crumlin, described the theft as "despicable". "These are the worst kind of people," she said. "We are calling all the scrap merchants to let them know about this so it isn't melted down. "It's very distressing for people and it's not as if the plaque will be worth much." The plaque was one of three on a commemoration wall built into an alcove near Crumlin Park on Mining School Hill. The three plaques are dedicated to those killed in World War I and II as well as soldiers who died in other battles. The stolen plaque was dedicated to WW1 soldiers and measures 4ft by 2ft (1.2m by 0.6m), said Ms Jenkins. Alan Parker, secretary of the local branch of the Royal British Legion, said he was "very disappointed" by the theft. "Those men gave the ultimate sacrifice and some unmentionable comes along, rips the plaque off the wall and they are probably going to sell it for scrap. "It is disgraceful behaviour and I can only hope that any scrap metal dealer who receives the plaque reports it as a theft." Gwent Police has issued an appeal for information and witnesses. Anyone who can help police can contact them on 01633 838111 or Crimestoppers on 0800 555111.